The first thing I usually think of when hearing Buffets is GROSS. Especially when you are visiting Las Vegas and paying like $15+ for said buffet. During my recent stay at the Mirage Hotel on the Vegas Strip, I visited one of these usually overpriced, gross buffets named Cravings. Cravings is located toward the guest elevators in the casino. 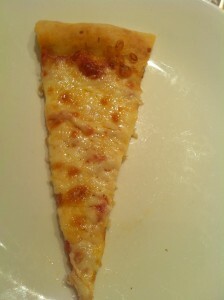 I was so happy to see that during the breakfast buffet, they had pizza! Cravings buffet in the Mirage Hotel actually had a pizza oven, I guess mainly used during the dinner buffet. I grabbed a slice that appeared to be sitting out for too long just for kicks, figuring I would find a new place that would be perfectly titled worst casino pizza. When I sat down and took a bit out of this hairline sized slice, I couldn't believe that it was not only hot, but really good considering my expectations. The cheese actually had a taste reminiscent to grande (although it wasn't grande), the sauce was very lightly applied oven a kind of soggy crust. I cannot properly judge the crust since I have a feeling fresh out of the oven it was a bit firmer. By the time I got this pizza and brought it back to my table and ate some of my other food, it definitely had too much time to cool down. What I did taste was average though. In my opinion the pizza at the Cravings Buffet in the Mirage Hotel and Casino in Las Vegas has been some of the best buffet style pizza I have tried around the strip. It isn't like I would "crave" this pizza and insist that I go to the hotel from another location just to get the pizza here, but given the opportunity to be within the Mirage again, I most definitely would eat the pizza from this buffet again. Cravings Buffet in the Mirage Hotel gets 4 out of 8 slices.